His & hers therapies. I’m so happy to say that Mr. Zombie is finally home. And thanks to modern medical marvels, aka the PICC line (a “diy” IV system) - the Infection-Zombie gets his RX treatment at home - rather then spending 6-8 more weeks in the hospital. That just blows my mind. The hospital (OHSU) was fantastic and they couldn’t be more pro-family and made a bummer situation so much better. And perks that scored big with me… the staff of course, but also the 24/7 cafeteria with really good organic/free trade coffee. But home is best, not to mention I can do without the daily almost 2 hour drive each way. Mr. Z’s infection (in the donor bone) will take a while to rid of, but he’s on the right track and we see progress each day. Our heartfelt thanks to all who bestowed us with good wishes and thoughts, comments and emails… now THAT was truly the best RX - for both of us! Physical therapy starts again soon for Mr. Z. I didn’t know it at the time, but I was picking up my “prescription” while I was in Arizona. Ahhh… Arizona. I had blast with my girl-gang. I want to go back. This was my second time in Phoenix, and I need a third - I want to visit my sweet pals Jona and Bren… and a trip up to Sedona is in order too. 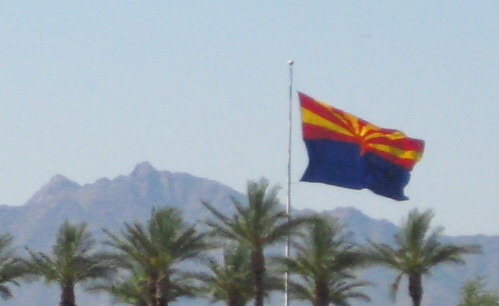 I love the Arizona flag - I’m just gaga about it. It’s so graphic and bold, and very, very cool. It has an art-quilt quality and fantastic branding to it. I want to cut up some fabric and make one for myself. I love the flag of my home state (California Republic) and my adopted state’s flag (Oregon) is a snooze… but Arizona’s flag is King of The Flags. Top flag dog. Beauty found in a Phoenix strip mall. Surprise! Or as I like to say… Supplies! This never got old for me, even though I drove the girl gang nuts and was threatened with getting kicked out of the car. 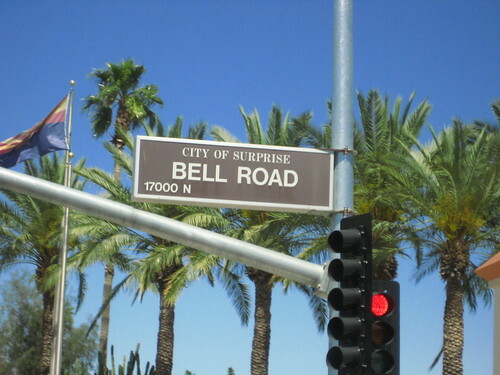 Arizona has the best names for cities and towns. I love these names… Bumble Bee, Happy Jack, Carefree, Grasshopper, Christmas and Sunflower. And these towns/cities say “Arizona” all over them… Skull Valley, Iron Springs, Black Canyon City and Maverick. Best flag. Best city names. And a ton of In-n-Out’s. Sigh. You rock, Arizona. At a JoAnn’s in Phoenix. Merchandising the HZ way. Sure is loud in here. Ahhh. That’s better. 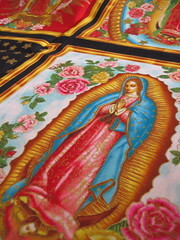 Dia de los Muertos (Day of the Dead), Nuestra Señora de Guadalupe (Our Lady of Guadalupe) and Calavera de Azúcar (sugar skulls) are not an easy find here in the Pacific Northwest. I KNEW I’d score big in Arizona! Another score were the tiles I found at Hobby Lobby. And what a score Hobby Lobby is! So jealous they’re not on the West Coast. 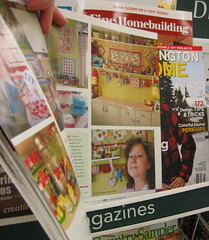 I first heard of Hobby Lobby via Blogland… and I must say that I really liked it. It’s as if Micheal’s and HomeGoods had a night in Vegas… and 9 months later a little Hobby Lobby was born. 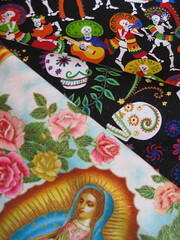 And then there are the fabrics that came home with me - even though there was already some of it at home. For the I-Just-Can’t-Get-Enough-Of-These files. There’s always room for more Sandi, Tanya, Heather and Jennifer in my cupboards! 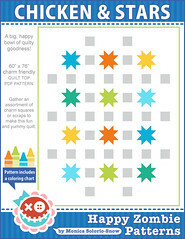 We visited Quiltz - a shop being featured in the upcoming Quilt Sampler. We had high expectations, and boy did Quiltz deliver. I can see why it made the top ten in Quilt Sampler. Beautiful store and wonderful shopkeepers and staff. The store was heavily peppered with my favorite fabrics (in my realm of unreality, I know they set the store just for me). A definite e-ticket of a quilt shop, and the small world part - was that the owners were from Scapposse, Oregon… just up the river from me. Fabric shopping is all good and fun, but there’s nothing better to make your husband’s-having-emergency-surgery-and-you’re-out-of-state-scrary-sucky-day… then to come home and find that your sweet friend Nanette has sent you some cotton love from her stash. A total OMG moment. LOOK at what she sent me! Talk about vintage goodness, and all the better because it’s from Nanette’s cupboards-o-joy. Just dreamy. 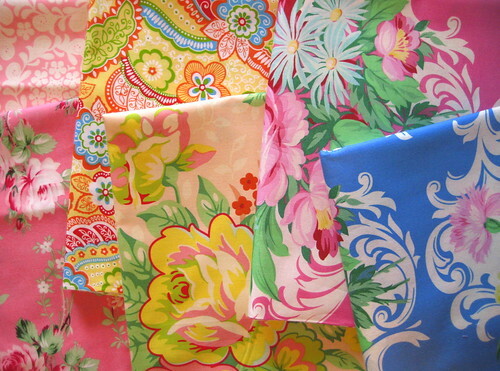 Nanette has a knack for vintage fabrics. She’s THE vintage fabric whisperer. I’m just waiting for the day she gets gobbled up by a fabric company as a repo designer - and we can all have some of her vintage joys in our cupboards. But wait, there’s more! Nireko sent me these beautiful Lecien bundles of Mrs. March’s 30’s. Sooooo stinkin’ cute. Nireko sent me some other goodies, like the darling box she made - and filled with tiny little Japanese treats that are Triskit sized. Saving that for another post. Just too darn cute. And now that we’re settling back in to “normal”, and the big scare is on it’s way out… time to focus on some more fun stuff! 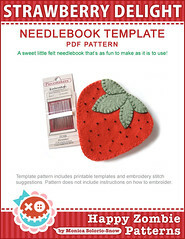 I have had my head down sewing for 4 months and have not peeked at a blog until today, I picked the right one as my first stop! I’m glad “hubby-z” is on the mend and that you are as entertaining as ever. Wow, great post today. Love the “all things Arizona”. 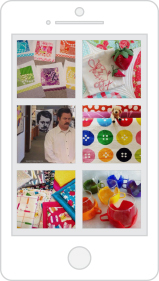 Did you get a chance to visit Sas fabric store? Oh, you would have fainted at all the fabric and trims. 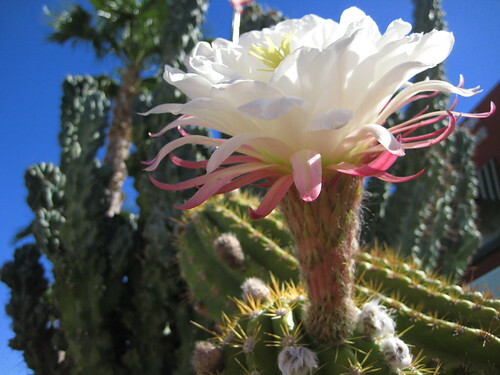 Grand photos, especially the cactus flower. Happy for hubby. Have a good day! It’s as if Micheal’s and HomeGoods had a night in Vegas… and 9 months later a little Hobby Lobby was born. Oh but you have such a way with the words, M. And don’t be jealous but there are three Hobby Lobbys within 30 minutes of me — and one only 6 miles away. Glad the Mr. is home. Hope he’s fully mended soon. Welcome back and hope things continue to improve for Mr. Z. You have some awesome fabric to get sewing on! So thankful to hear that you and the Mr. are home - my prayers are with you. 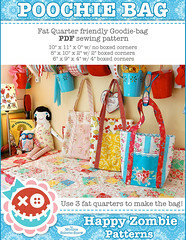 Nanette’s fabrics are amazing! Somehow I missed that your husband was quite ill, I am glad to hear things are looking up. Woohoo — things are looking up! So glad to hear about hubby and that things are going well. But what’s going on up there??? Is that TY moving in on you??? (At least we know you weren’t off galavanting alone with you-know-who.) We just can’t let you out of our sight. There’s gonna hafta be a family council. Do you have anything to say for yourself??? You were in my neck of the woods. Sounds like you were in the Arrowhead Towne Center Mall which is right across the street from where I work, Joann’s is too. That is pretty crazy. And, you went to my favorite quilt store Quiltz. It is an awesome store, my favorite. 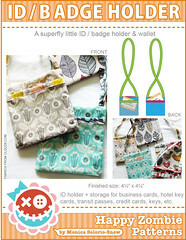 In fact I’m going to be there is coming Saturday for a tote bag class. I am glad your hubs is getting better! Love the fabrics in the post. Great therapy, for sure! You were definitely in my corner of the woods too. (Except that there are no ‘woods’ in AZ … or at least in this part of AZ.) Since I frequently … frequent Quiltz (living less than 10 minutes away) perhaps I saw you anyway. But it’s nice to know that you took a rather huge chunk of AZ fabric home with you. I’m so glad that Mr. Z is improving - and that he’ll be able to do his improving at home. Lovely fabric. You always make any fabric look so lucious. 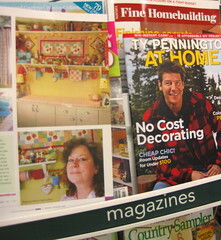 Hopefully I’ll be able to get your magazine this week. So glad your Mr. is improving and at home! I’ve never even thought about visiting Arizona before - but what a great place for a girl trip! Love the tiny tulip fabric! Hi Monica, I’m glad Mr Z is feeling so much better. I love those little Japanese “treats”. Can’t wait to see your April basket! So much fun stuff! And glad your husband is doing well, too! And your phrase about Nanette…The Vintage Fabric Whisperer…that’s EXACTLY her!!! 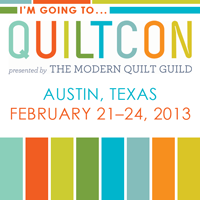 I sooo agree she should be designing fabric…and I get to meet her for lunch Saturday to talk fabric and quilts!!! well mister zombie doesn’t kid when really all he had to say was “uh honey can you just stay here with me and hang out?” seriously, all that just to get you home?! ps i hope he gets better soon. I am so glad that MrZ is home and doing better! I know how stressed you were when he was admitted. Glad that he is on the road to recovery. Next visit, we will definitely find more sights and shops! I found a great area (full of saguaro, too) not too far from my house, so we can do some better photos…no parking lot shots!! What sweet things to say Monica. I’m blushing and humbled. It is a pleasure to be your friend and I am so happy to meet women like you (well sorta meet) that I have things in common with and we can exchange ideas and support. What a wonderful thing to do! The fabric is really art. I got my Monica magazine Monday. Your room is an inspiration to so many. Sometimes I think “how can I make my room more ‘monica’”? I’ve got some ideas in mind for a little wasted space under a shelf. Fun. I’m so glad Mr. Z is better. I thought about you and you were in my prayers over the weekend. PICC lines are amazing. Thanks again. I appreciate your sweet words more than you know. Holy Crap on all of it. Great pictures, great treats (Nanette is my whisperer too) and SUPER GREAT Tman is home. Glad to hear Mr. Z is on the mend! Loved your description of HL, even my kids don’t whine when we stop there to shop. 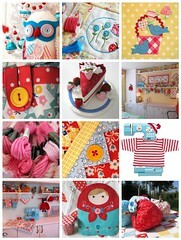 Yummy fabrics, have some fun! I’m glad to hear that Mr. Z is getting better. And all that shopping and fabric happiness! Mmmm, nice loot from AZ! Y’know, a shop from near me is in the next Quilt Samper too. Although, psst, I’m not crazy about it. It doesn’t carry Lakehouse, Lecien or much 30’s fabric at all. It seems to focus mostly on civil war and batiks (not my fave). Anyway it’s cool they’ll be in the magazine though. I too am glad to hear Mr. Z is doing better!! Yes, PICC lines are a great invention!! Also happy you came home with some fabaric goodness. I get to have lunch and talk fabric with the famous and talented Nanette Saturday!! Way to go Mr. Z…Hello Joe Joe’s extra wish we sent came true! And Monica, at least you got to enjoy some of your trip - I love that you and Ty are sharing a shelf - and hey, there is nothing wrong with a little self-agrandizing - you go gal! Love the fabrics Nanette and Nireko sent - they’re happy enough to make even Mr. Z light up! Your trip to AZ sounds awesome! I’m glad Mr. Z is home. I’ll still be praying for you both! Thoughts are with you and Mr. Z. at this time. I’m an art therapist who works in a hospital and was recently hospitalized, so yes. I can agree with you — home is best! Here’s to a happy recovery and to sublimating all of those health-and-hospital emotions into your projects. I love to read your blog. So when do the rest of us get to grab up some o’ that SWEET lecien fabric? Holy crap===memory of a gnat I have–SUPER COOL AND BIG CONGRATS on the magazine! Look at your smilin’ mug :-D That’s the new studio spaces one, right? Must put that in my radar. So glad Mr. Z is home and on the mend. I’m headed to Phoenix in a few weeks myself so I’ll look for Hobby Lobby and Quiltz, I can hear those fabrics calling to me now. (yea, I know I can find them in SoCal but somehow stash building away from home seems so much more adventurous! 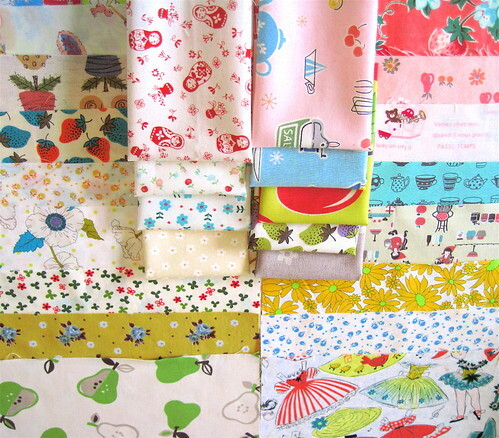 Thank you for the fun fabric pics- we can’t get enough! I’m happy that you and your delightful posts are back. I’m feeling some fabric envy here. Lovely pics! And that cactus flower is gorgeous! I’m not a fan of deserts but I’ve never seen such a gorgeous flower either. 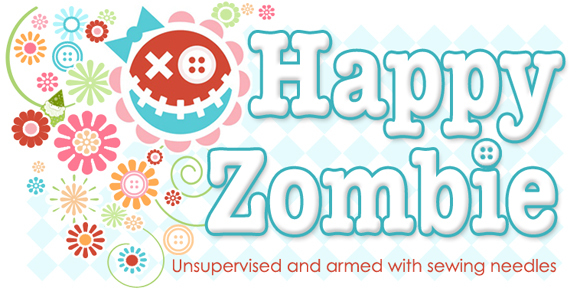 Glad to hear that Mr. Zombie is recovering well. So glad Mr. Z is headed down the right path–and I loved reliving the Arizona getaway. 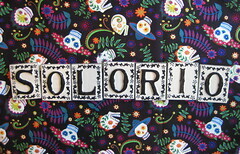 Those tiles and your Dios de los Muertos combine for a great photo! So, so sorry to hear about Mr. Z’s nasty infection and surgery–I haven’t been keeping up on blogs lately, so just learned of it. I’m glad he’s on the mend, but what a scary thing for you and yours. I’m glad you had fun in Phoenix, though. 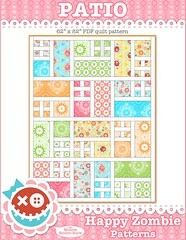 I agree, Quiltz is a treasure. 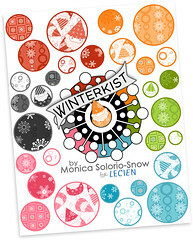 I got to write the copy about it for the upcoming Quilt Sampler and owner Darleen is a peach–I really enjoyed talking with her. 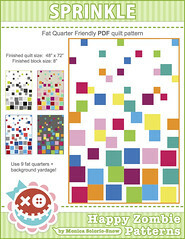 Quiltz is the fourth fabric store she’s owned, so the gal knows what she’s doing! 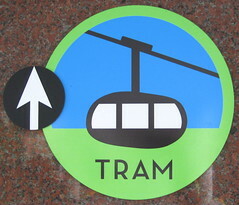 I discovered it last March when we were in Phoenix and sadly don’t have any trips back there planned. It’s worth the trip! Yay for Mr. Z. so glad he is on the mend. It’s so disconcerting to be gone when stuff like that happens isn’t it? I was out of town when my son broke his arm and had to have surgery. Ugh. But luckily you got to be there for the yummy cafeteria food. I grew up in PHX my Dad is still there - it really is a great city, it’s changed so much since the 80s when I lived there. Glad u had fun. can Mr. Z put his own concoctions in the PICC? mai tai on demand? Glad to hear things are getting back to fun at the ranch …. and that everybody is getting or got their appropriate therapy …. I’m thinkin’ your therapy is more fun than Mr. Z’s …. but that’s what he gets for interrupting your girl gang get away with a major infection ….. SHEESH! the NERVE of some people!!!!! OMG I am loving Mrs. March’s 30’s. LOVE THEM!!! Nice fabric love from Nannette. Always nice to get a surprise in the mail. Glad hubby is home and hopefully improving. My prayers are with you and Mr. Z- be careful with the PICC line- keep it clean and safe! So glad Mr. hubbs Z is doing better and loved hearing about your trip. Wow, pretty fabrics. And hey you got mail, or you will get mail. It appears there is a new rule that you have to actually mail the mail for the person to get the mail :-)!!!!!! Wonderful post. I miss Hobby Lobby. We don’t have them here in my part of Florida. I am SO happy to hear that Tman is HOME!!! Love your impressions of Phoenix, and I must find a Hobby Lobby someday! 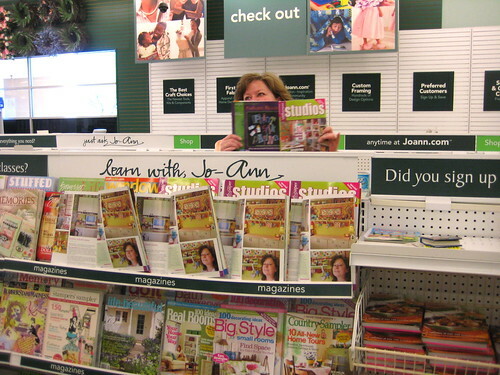 I can’t locate “your” magazine anywhere, so I guess a trip to JoAnn’s is in order. 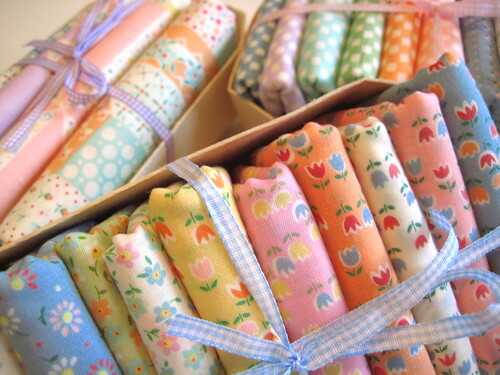 The fabric from Nanette is wondrous - she does have a great knack for the vintage treasures, doesn’t she? Mrs. March’s 30’s fabric is a-dor-able!! Ah…how I loved my three years we lived in Surprise!!! I miss AZ tremendously, and am super jealous of the new quilt store…although Cotton Fields was pretty darn good when I lived there! Glad you enjoyed the sun! I know this post is old but I couldn’t help but leave a comment about AZ. I LOVE it there. All my friends think my love for it makes me a weirdo, but I don’t care. It’s good to see someone else love it too! Also you forgot about Strawberry, AZ and Cherry, AZ. That is an awesome name for a town in my opinion.